Pandas uses C extensions (mostly written using Cython) to speed up certain operations. To install pandas from source, you need to compile these C extensions, which means you need a C compiler. This process depends on which platform you’re using. Follow the CPython contributing guidelines for getting a compiler installed. You don’t need to do any of the ./configure or make steps; you only need to install the compiler. For Windows developers, the following links may be helpful. If you aren’t using conda for you development environment, follow these instructions. You’ll need to have at least python3.5 installed on your system. git diff master --name-only -- "*.py"
Alternatively, you can install the grep and xargs commands via the MinGW toolchain, and it will allow you to run the commands above. 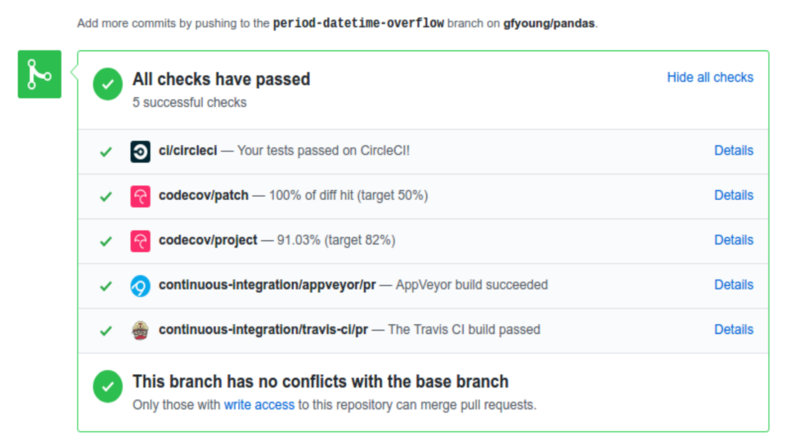 The pandas test suite will run automatically on Travis-CI, Appveyor, and Circle CI continuous integration services, once your pull request is submitted. However, if you wish to run the test suite on a branch prior to submitting the pull request, then the continuous integration services need to be hooked to your GitHub repository. Instructions are here for Travis-CI, Appveyor , and CircleCI. Each time you push to your fork, a new run of the tests will be triggered on the CI. Appveyor will auto-cancel any non-currently-running tests for that same pull-request. You can enable the auto-cancel feature for Travis-CI here and for CircleCI here. The earliest supported pytest version is 3.1.0. Changes should be reflected in the release notes located in doc/source/whatsnew/vx.y.z.txt. This file contains an ongoing change log for each release. Add an entry to this file to document your fix, enhancement or (unavoidable) breaking change. Make sure to include the GitHub issue number when adding your entry (using :issue:`1234` where 1234 is the issue/pull request number).